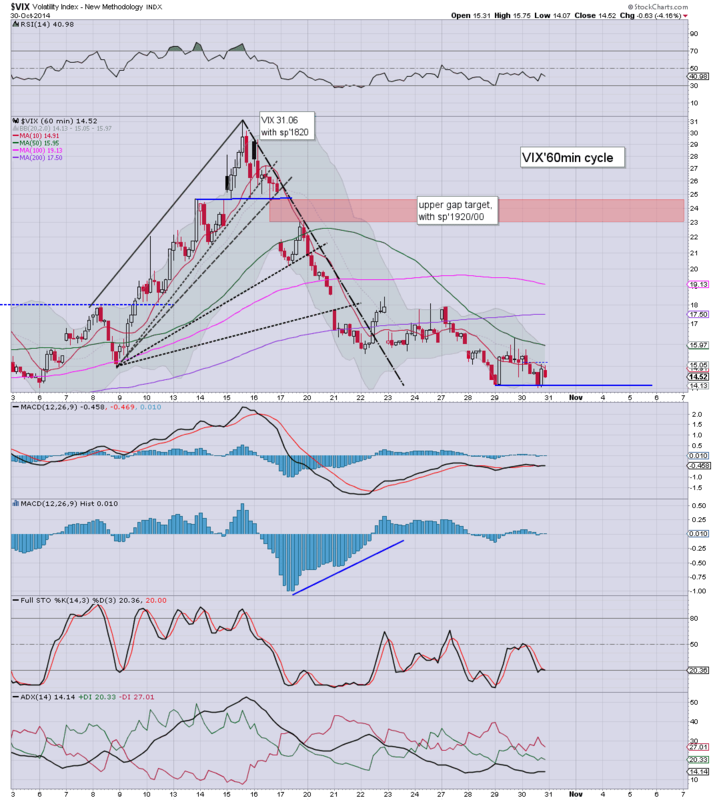 With US equities seeing a new cycle high of sp'1999, the VIX was pressured lower, settling -4.1% @ 14.52 (range 15.75/14.07). 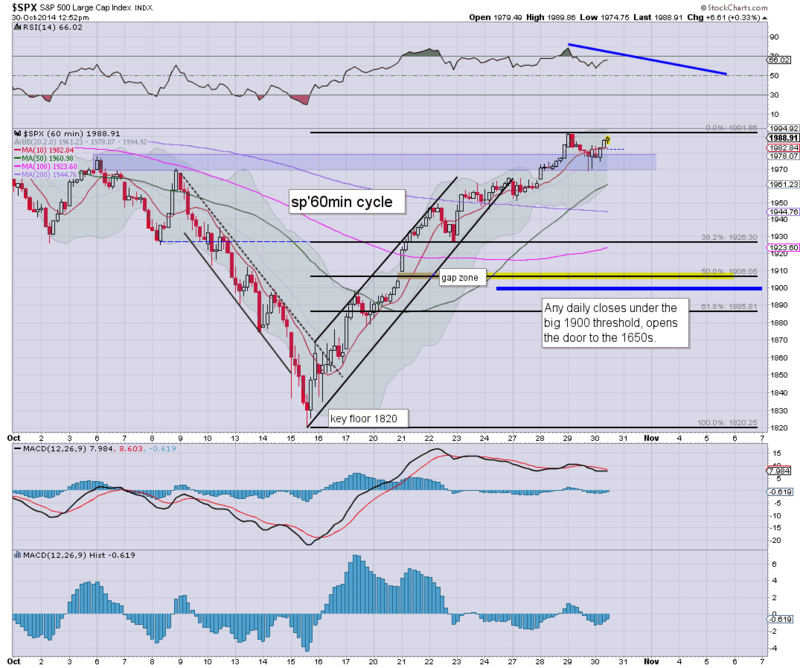 Near term outlook is for the 14s to hold as a floor, before renewed equity weakness... at least to the sp'1930/25 zone. Suffice to say... VIX remains low.. but on any basis.. we're due another push back upward.. to test the big 20 threshold. Whether we can break the recent 31.06 high... will of course be entirely dependent on whether the bears can break back under the critical sp'1900 threshold. After this afternoon's crazy action (based on a two week old news story)... that won't be easy. US equities closed somewhat mixed, sp +12pts @ 1994. The Dow (greatly influenced by Visa), +1.3%. The two leaders - Trans/R2K, settled -0.9% and +0.8% respectively. Near term outlook is very borderline, equity bulls desperately need a monthly close at least in the sp'1960s. Without question, today was the craziest day since the Wednesday of two weeks ago, when we floored at sp'1820....and with Fed official bullard alluding to QE3 not ending... and with QE4 viable. Today's recycled news via the Nikkei news wires (Japanese Govt. to increase stocks as percentage of investment funds) has really caused some havoc to a great many bears. I'd sure like to know who the hell re-issued that news story... and why. Keep in mind that it was 2am in Japan when the story appeared. US equities are starting to cool from their earlier cycle high of sp'1999. The 'old news' has caused havoc in market land, with truck loads of short-stops being hit, the largest e-mini futures trade in a single second ($0.5bn)... and problematic issues with market quotes. Equity bears are riding a crazy boat... in a tunnel of madness... lead by a maniac. I love the drama of the market.. but today sure is testing my tolerance. 3.07pm... sp'1989.. with VIX -1.7%... choppy.. but there the hourly cycle is offering some huge bearish divergences into the weekend. 3.17pm.... Seeking a net daily gain in the VIX... in the mid 15s.... might equate to sp'1984/82..
3.40pm.... A crazy afternoon in market land. A lot will be said by many after the close... not least on the 'broken market'.. and the giant e-mini futures trade on the 'old news'. As things are... seeking... more than anything.. a VIX daily net gain. 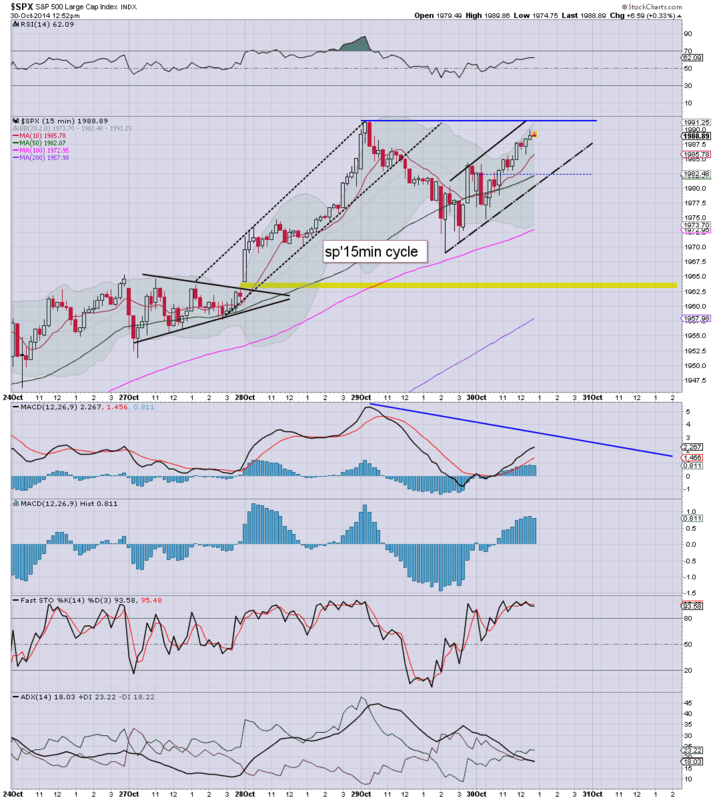 It would seem a two week old story from the Nikkei Asian Review has been reposted, causing a spike in stocks, making a new cycle high of sp'1996.. a mere 1.2% from breaking a new historic high. Crazy.... simply... crazy. No doubt some bulls will claim this afternoons gains are due to 'real buyers'..but its clear... there is some truly suspect nonsense going on today. 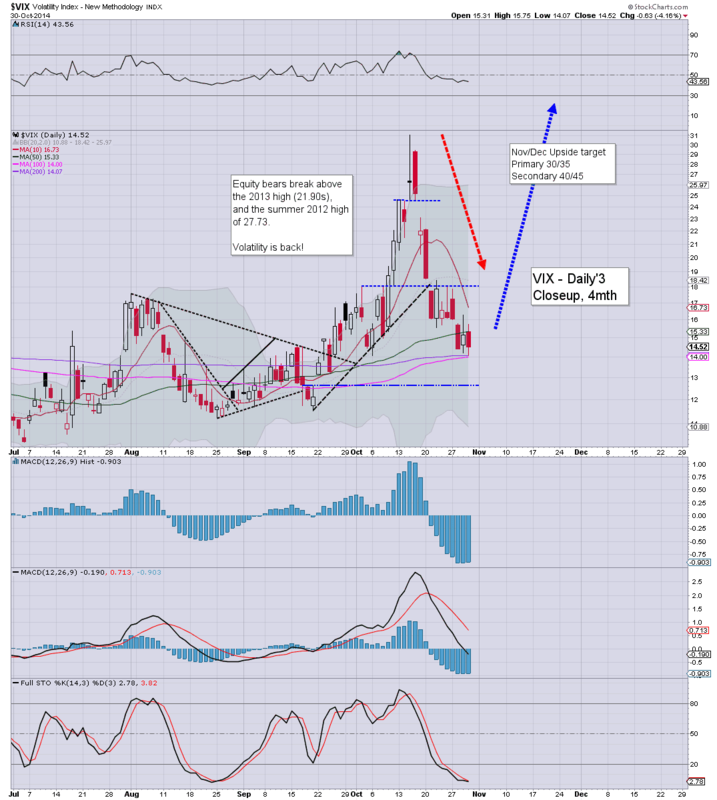 VIX in danger of breaking 13s.. if sp'2000s. Frankly... this is getting damn annoying... not because we're higher.. but because of the reason we're higher. 2.10pm.... A crazy day in market land, with afternoon mini chaos.. due to the recycled news story on the Nikkei news wires. A huge amount of short-stops are being hit... and it'd almost be surprising if we don't at least briefly break the giant 2000 threshold. Crazy market...... today really is causing real problems. US equities remain moderately higher, with the sp' making a play for the Wed' high of 1991. A micro double top seems viable, before the first sig' downside. Metals remain in collapse mode, Gold -$10, with Silver -3.7%. The miner ETF of GDX -4.8%. 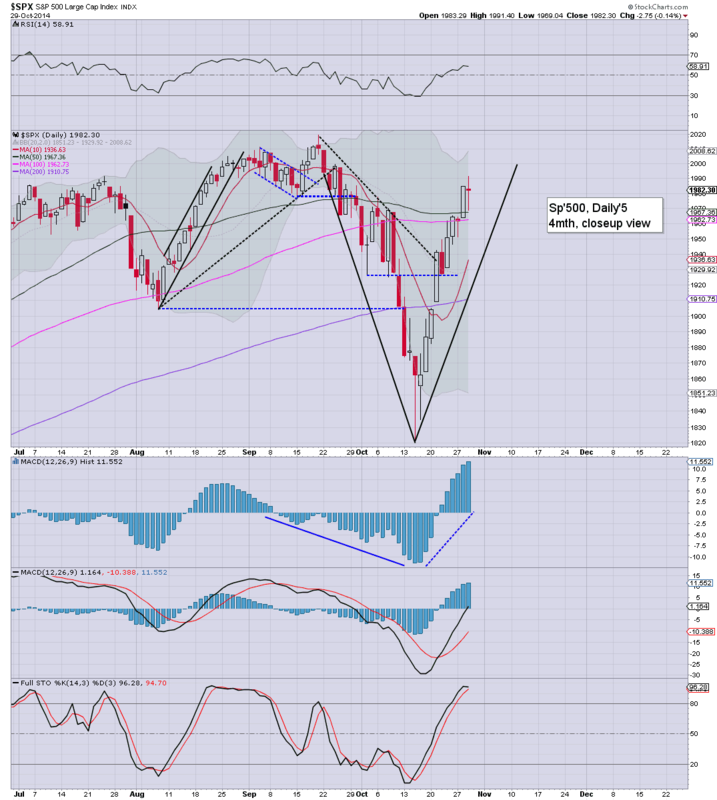 A bit of a messy day.... minor weakness, but we are effectively seeing the big sp'500 coming close to a double top. I realise some out there are still looking for a straight run into the sp'2000s.. with new historic highs.. but I just can't see that. Dow +150pts, but almost all of that is due to Visa (V) +8.9%.. which is pretty incredible.. but then.. earnings were pretty good. 1.23pm.. sp'1992.... hmm, surprising... no doubt a lot of short-stops are getting hit.. hence the kick upwards. On any basis, I want to see a daily close back in the low 1980s... or today will be somewhat annoying. US equities continue to see minor chop, but there is weakness out there. With further declines in the precious metals, there is sector destruction in the miners, the ETF of GDX -5.4% in the 18s... headed for 15/14. 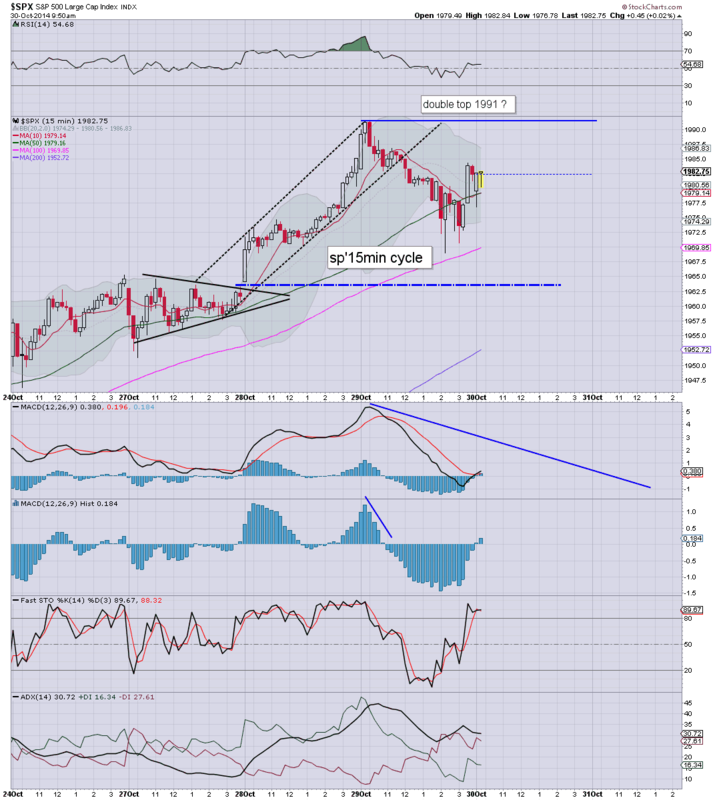 *the action in the metals is getting close to initiating a crash wave. The June 2013 floor was Gold $1179. A break under that will open up the giant $1000 threshold... next month. If that is the case, most miners will fall a further 35/50% in the near term. As for main market... so long as we don't break >1991... price structure is a bear flag... targeting the low 1960/50s.... tomorrow. 12.17pm...I was looking for a micro double top yesterday around 1990.. and we now look set to get one by 2.30pm. Oh well, I won't complain...but I sure want to see the low 1960s tomorrow.. for a monthly close. Despite the Dow being higher by over 100pts this morning, the rest of the market looks tired. The 'old leader' Trans has already slipped by -1.5%.. and there looks to be viable weakness all the way into the Friday/monthly close. *Dow is the anomaly..because of Visa. 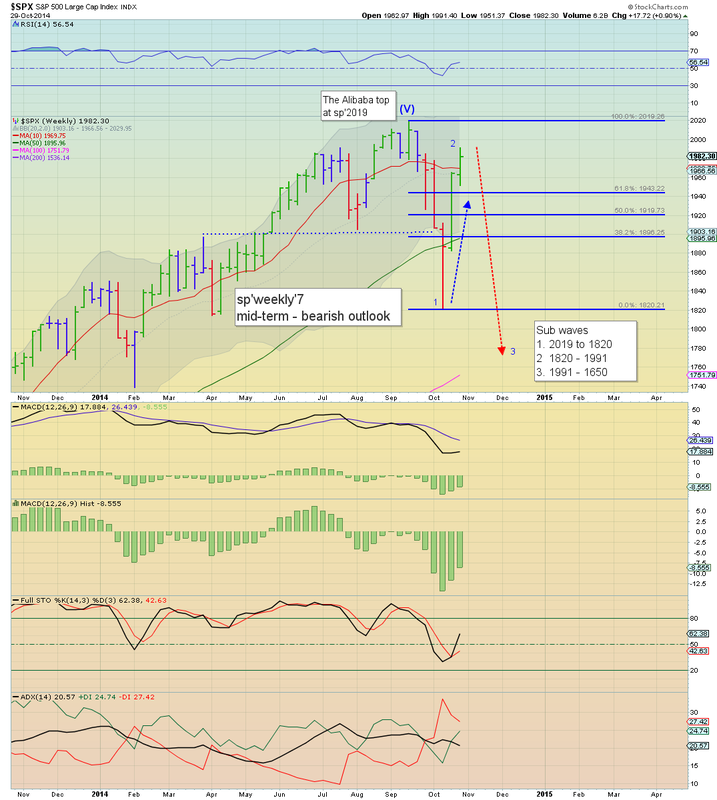 Overall, market is looking tired...and due a retrace down to the 1920s....but clearly, that will take us into next week. *I am short this morning, from sp'1981, will look to hold into late Friday afternoon, with an exit into the weekend. Meanwhile... absolute sector destruction..... miners ETF, GDX -5.6%... and Gold ain't even broke critical support yet.... but it will. US equities recover from their pre-market lows, turning a touch positive. A test of the 1991 high is just about possible this morning. VIX is showing no market concern, melting fractionally lower in the low 15s. *I remain on standby to launch a short-index position. Am watching the smaller 60/15/5 min cycles. Certainly, anything much above 1986... is pretty tempting. 9.56am... SHORT-indexes (via SPY) from sp'1981.... smaller 5/15min cycles look tired. 10.00am.. 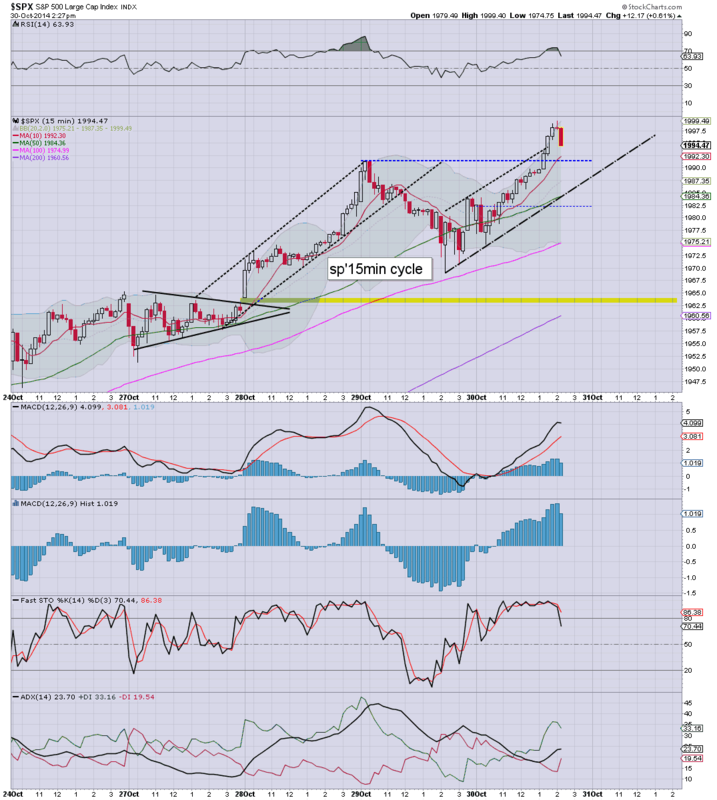 So, I'm short from 1981.. lets see if we can get a weekly close in the 1960s... or far better... the 1950s.. with VIX 18/19s. Starting to look like we have a clear 'marginal new high'... with a strong reversal. 10.26am.. Miners continue to implode.. GDX -4.2%.... incredible to see.. but as expected. Only another 25% to go ! Good morning. Futures are moderately lower, sp -11pts, we're set to open at 1971. Precious metals are sharply lower, Gold -$9, with Silver down a very significant -2.8%. Oil is similarly weak, -1.3%, and that is no doubt rattling the equity market. So, we're set to open somewhat lower, and the issue remains.. was sp'1991 the top of a large wave'2 'hyper-bounce'. 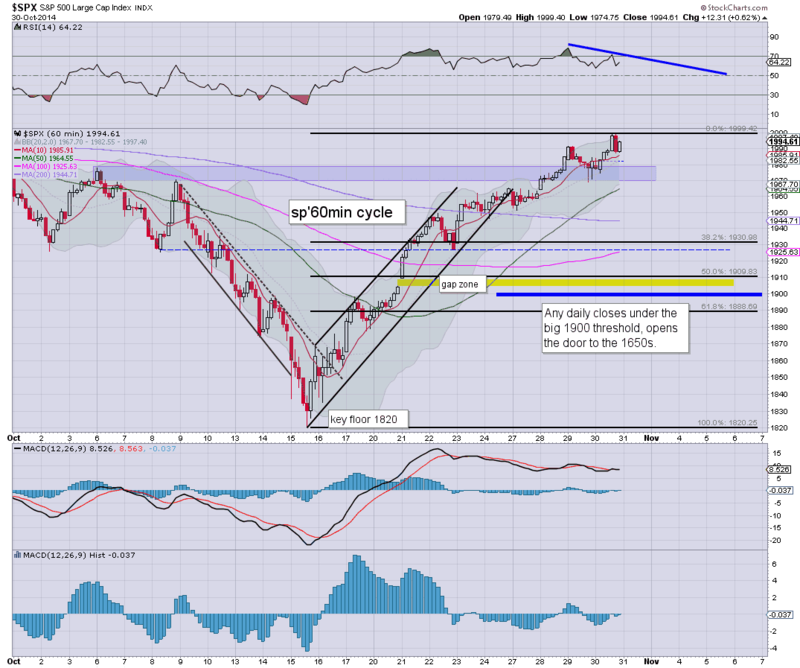 Perhaps, but there will be no clarity until a break back under the sp'1900 thershold. 8.31am.. GDP Q3: 3.5% vs 3.0 expected, certainly, a fair bit better, and the mid 3s isn't that bad a number... but as ever.. could get revised much... much lower. 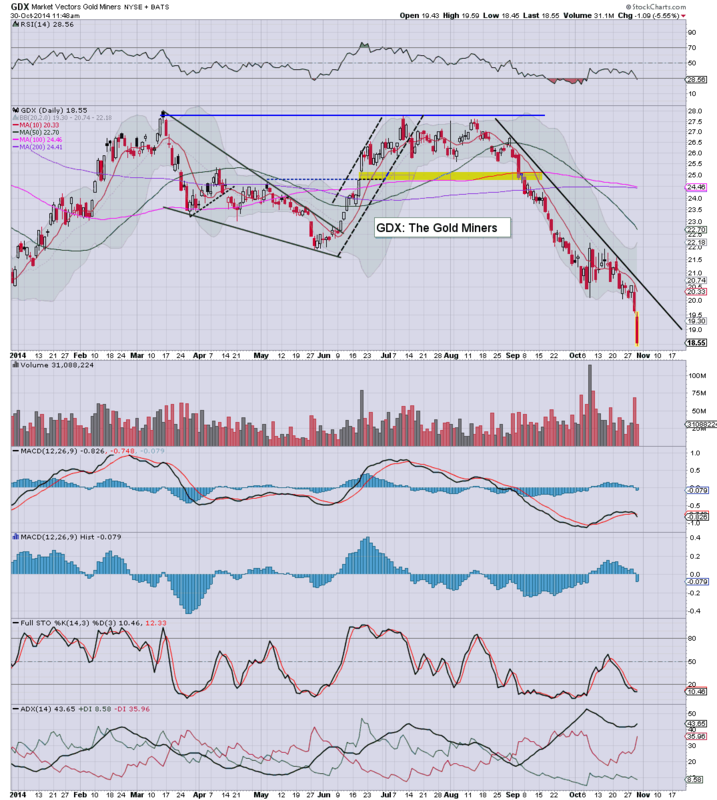 Notable weakness, Gold -$10... miners......... GDX -1.1%.... horror show. Whilst the Fed confirmed that QE3 is now concluded, the bigger issue is what about equities next month? 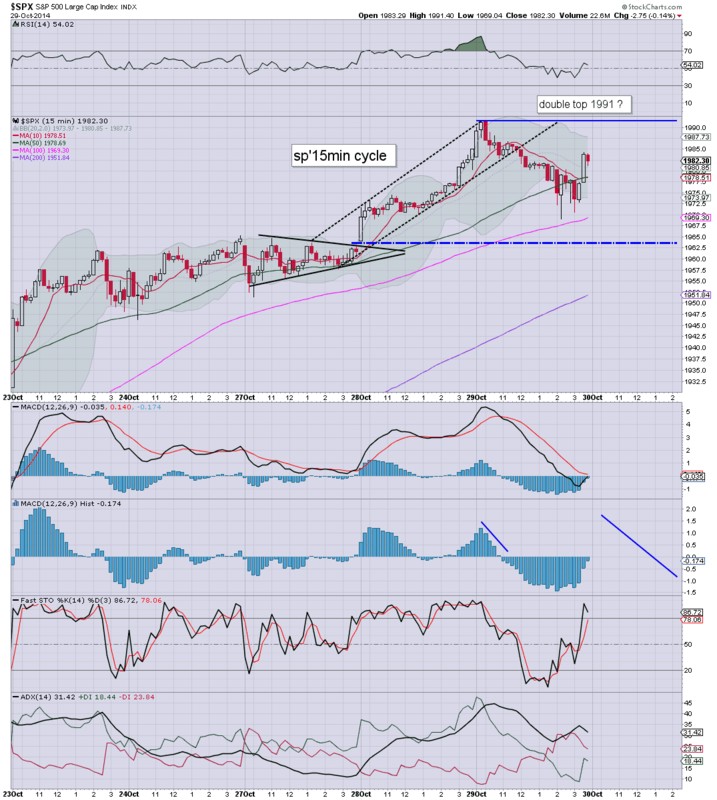 The recent ramp from sp'1820 to 1991 - a gain of 8.6%, has turned many back to a broadly bullish outlook... but there remains underlying weakness. sp'daily5c- the 3 warning levels. I wanted to start the last post of today with something which I consider pretty pivotal. The sp'1900 threshold is unquestionably a key threshold. In my view.. if we see any daily closes under sp'1900, it will open the trap door to a fast move to the sp'1650s - which remain a simple 38% fib retrace of the giant wave from Oct'2011. The current 'rainbow' weekly candle remains green, and even if we close 1-2% lower by the Friday/monthly close, it will still be green. 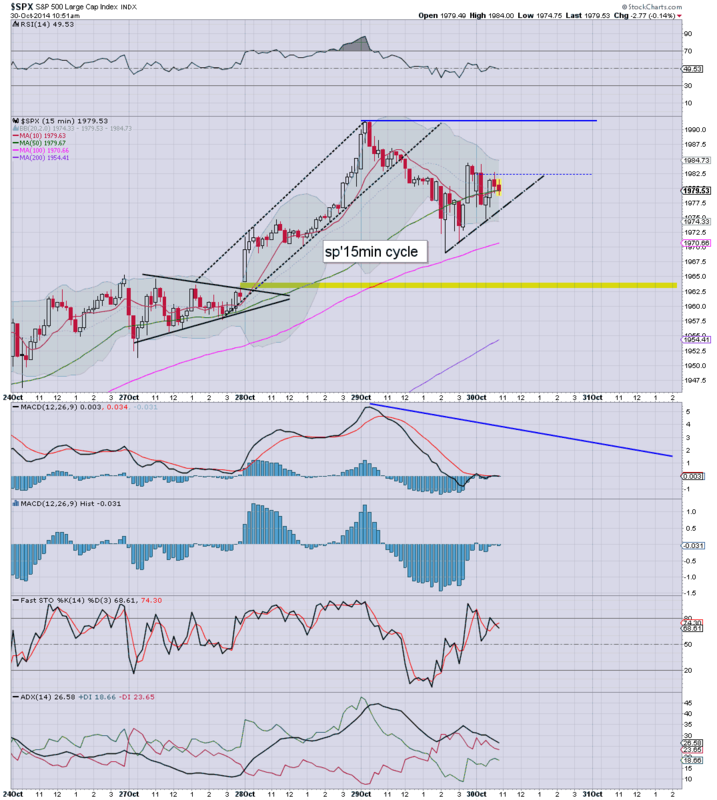 However, this is not unexpected, and it does not prevent the bigger bearish scenario. I still think many are overlooking the importance of the initial break under sp'1900. That was a crucial support, and it was decisively broken. A great deal of technical damage has been done. The fact we've soared back over it, is not that concerning to me. Indeed... a ramp into the mid 1900s was expected. We have the usual weekly jobs data, and Q3 GDP (first reading)... market is seeking 3.0%.. which seems a little overly optimistic. Yellen is due to speak at 9am.. but it is not related to the Fed, and should have ZERO bearing on the market tomorrow. Today was interesting, but I didn't take any positions. With the new cycle high of 1991 in the morning, and weakness in the early afternoon, the smaller 5/15min cycles looked too low to launch an index short... so I held off. Instead, I will look for a micro double top around 1990 early Thursday morning. If we get stuck there.. I'll start hitting buttons.. with a first exit target of 1925 or so.. within 2-5 trading days... along with VIX 20s. US equities saw a new cycle high of sp'1991, but with the end of QE3, saw some moderate afternoon weakness, sp'500 settling -2pts @ 1982 (intra low 1969). The two leaders - Trans/R2K, settled lower by -0.5% and -0.3% respectively. 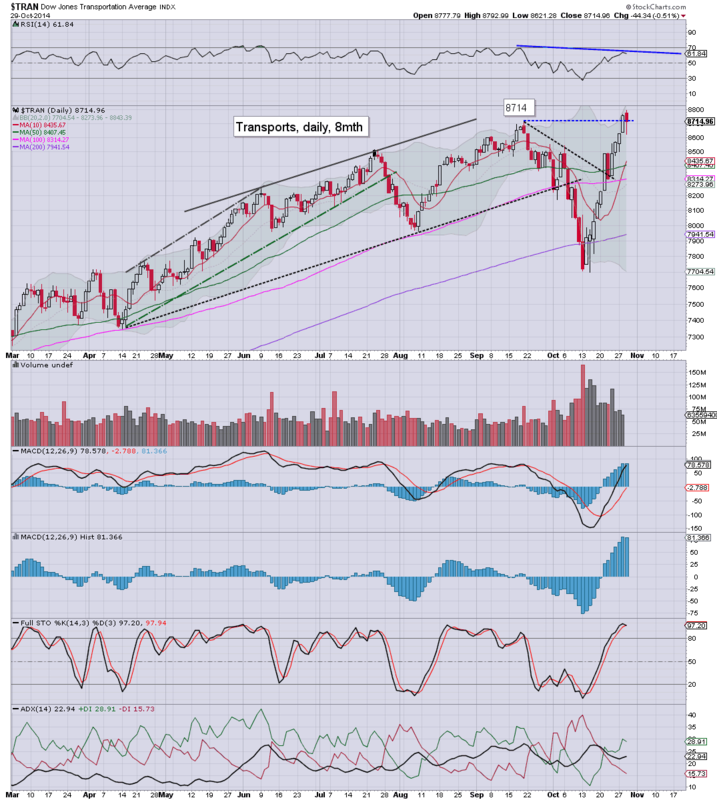 *it is again very notable that the Transports broke a new historic high, but did close moderately lower. A pretty interesting day in market land, and with the end of QE3, the market is finally going to have 'go it alone' for at least a few months. *I'm seeking to launch an index-short early tomorrow... possibly on a micro double top of sp'1990 or so. 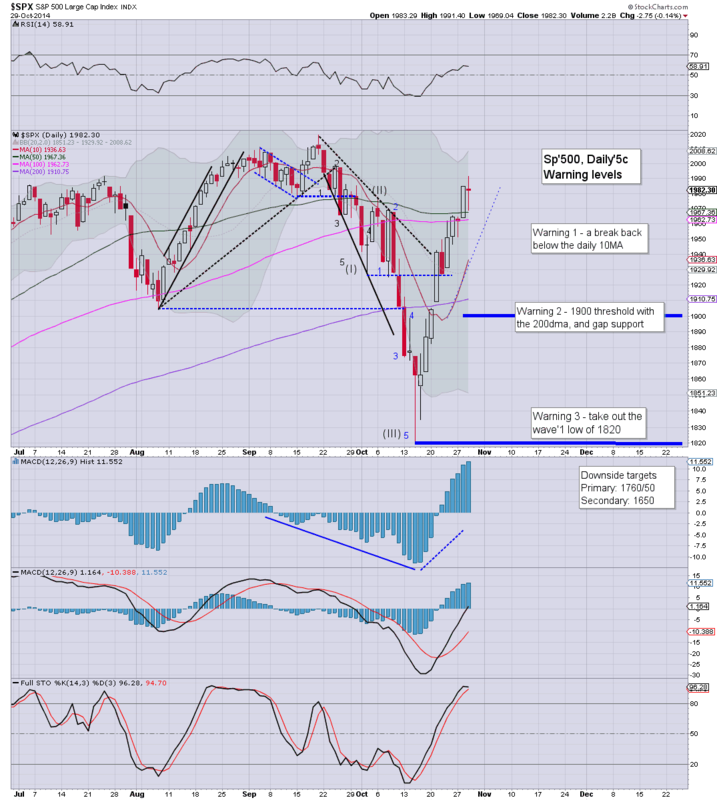 First downside target is sp'1920s, with VIX back in the low 20s.